The arrival of a military vessel at the fuel jetty at Loch Striven requires the services of a Naval Pilot as well as a Clyde Pilot. On Monday, the arrival of a US Naval tanker meant that Serco Denholm's pilot cutter SD CLYDE SPIRIT was used to take her pilot downfirth from Faslane to Loch Striven, and she is seen here passing McInroy's Point at speed. 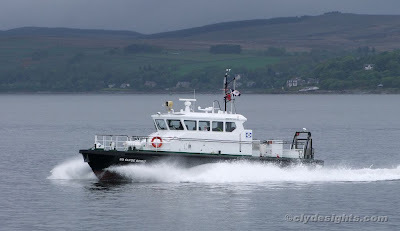 SD CLYDE SPIRIT was delivered from Damen Shipyards in 2008 as part of a major fleet renewal programme.